Velso ransomware uses sophisticated techniques to infiltrate computers and hide from its victims. Use Reimage to determine whether your system is infected and prevent the loss of your files. Velso virus is classified as a file-encrypting infection which locks the access to the most widely used files with AES algorithms and base64 public key. After data encryption, it appends .velso extension to the filenames of the encoded documents. Victims are informed about such actions in get_my_files.txt file and demanded to pay a ransom if they want to decrypt their data. Recently, experts spotted a new version of Velso ransomware which indicates that ransomware developers are trying to widen their spectre of infections. It is evident that now people should be extremely cautious once the new malware has hit the cyber space. On the affected computer, Velso virus might install several files that are responsible for performing various malicious activities. Additionally, malware can add new Windows Registry entries in order to run on system startup. When all preparatory job is finished, malware finally starts data encryption procedure. Crooks are supposed to respond with further instructions. However, malware researchers agree that sending an email to the provided address is not recommended. Authors of Velso ransomware will ask to pay the ransom, probably in Bitcoins. However, there are no guarantees that once you transfer the demanded sum of money, you will get a Velso decryptor. It’s unknown if hackers have this software created at first. Moreover, they might blackmail you into paying more money and never send you a working decryption tool. 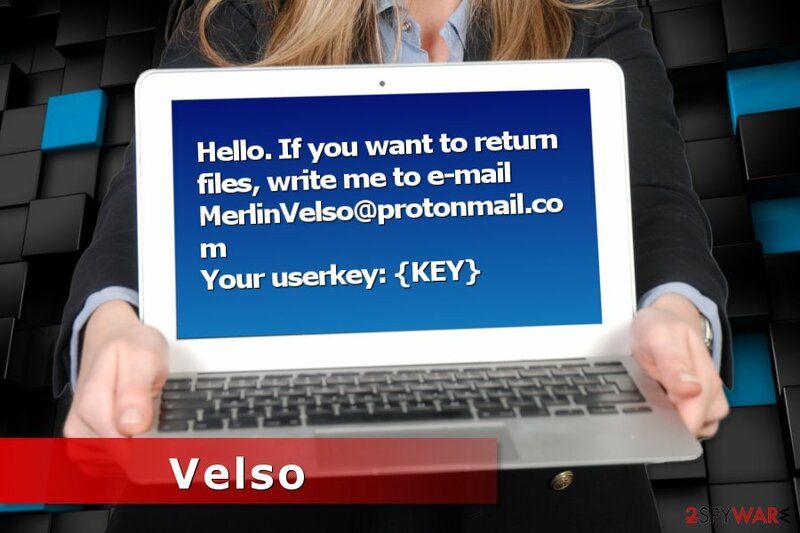 Velso ransomware uses .velso extension after data encryption. However, now victims can notice .david suffix as well since the virus has a new version. For this reason, it's highly recommended cleaning your computer from this cyber threat and not getting into business with criminals. Velso removal requires obtaining reputable malware elimination software and scanning the device with an updated tool. 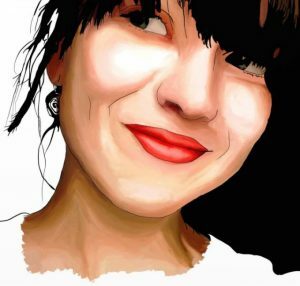 One of the best tools to remove Velso from the computer is Reimage. However, you can use any other professional security software too. If you have any obstacles with the elimination, you should check our prepared instructions below. In February, experts have detected a new offspring of the malware — .david file extension virus. Since it is still under investigation, it is hard to tell the whether its name will be left like this or changed to David ransomware. However, it is currently named based on the .david file extension it uses. Victims of .david file extension virus are asked to contact the criminals via davidfreemon2@aol.com email address. Even though it is currently unknown how much money people are demanded to pay for the decryption tool, we do not recommend trusting the criminals. Instead, read more about possible ways to decrypt files without paying the ransom at the end of this article. When a user what she or he is asked, malware payload is dropped and executed on the system. It’s highly recommended staying away from the spam folder. Also, you should always take all needed security measures to check if the attached Word or PDF file is actually safe. Malware research team from virusi.bg also reminds to be careful with software downloads or updates, eye-catchy or aggressive ads, and other shady corners of the Internet where cyber criminals might be waiting for the victims. However, don’t forget that no one is 100% protected from the cyber attack. Thus, creating and regularly updating backups is needed. It is evident that ransomware is a dangerous threat to your computer system. We want to inform you that regular computer users should not struggle to perform Velso removal by themselves. It is a highly complicated procedure which requires knowledge about IT systems. However, it is easy to get rid of Velso virus by using a professional antivirus software. Our favorite one is Reimage and we would suggest you to get it right now. Although, you can use Malwarebytes MalwarebytesCombo Cleaner, Plumbytes Anti-MalwareMalwarebytes Malwarebytes or another robust malware removal tool as well. However, ransomware might block your attempts to run security software. In this case, you need to reboot the system to Safe Mode with Networking as shown below. This mode will help to activate antivirus and remove Velso entirely. You should boot your computer into Safe Mode with Networking before trying to install the security software. Log in to your infected account and start the browser. Download Reimage or other legitimate anti-spyware program. Update it before a full system scan and remove malicious files that belong to your ransomware and complete Velso removal. Here is another way to reboot your computer to Safe Mode with Command Prompt in case you are still unable to get the antivirus. When a new window shows up, click Next and select your restore point that is prior the infiltration of Velso. After doing that, click Next. Once you restore your system to a previous date, download and scan your computer with Reimage and make sure that Velso removal is performed successfully. Guide which is presented above is supposed to help you remove Velso from your computer. To recover your encrypted files, we recommend using a detailed guide prepared by 2-spyware.com security experts. Even though this is a professional tool, it is not designed to recover all files encrypted by Velso ransomware. If you are unable to get all of them, to other methods below. Windows previous versions feature allows ransomware victims to recover files from their copies which were made before the attack. However, this feature requires System Restore enabled before malware infiltration. ^ Roger A. Grimes. Infected with malware? Check your Windows registry. CSO. 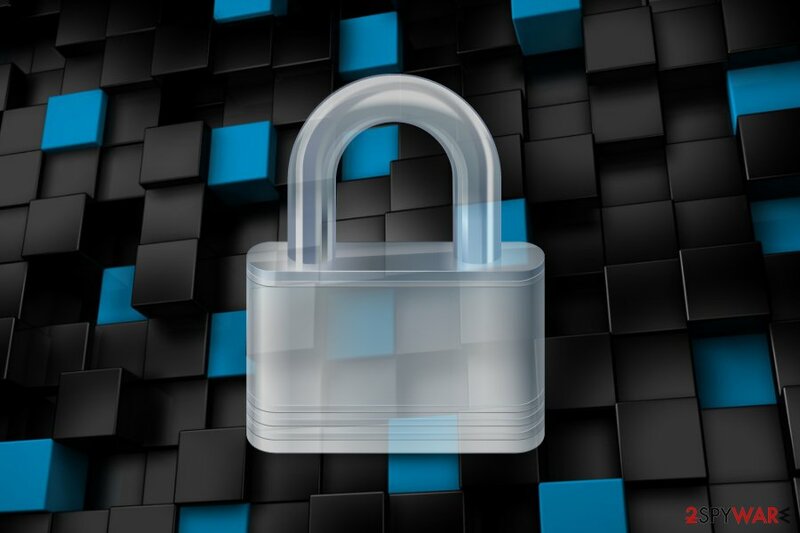 Security news, features and analysis. ^ Ganesh Umapathy. Evolution of Email Threats: The Rise of Ransomware, Spear Phishing and Whaling Attacks . SonicWall Blog. The blog about cyber threats. ^ Virusi. Virusi. Bulgarian cyber security reports. This entry was posted on 2018-02-13 at 05:20 and is filed under Ransomware, Viruses. You can quickly scan the QR code with your mobile device and have Velso ransomware manual removal instructions right in your pocket. How did you remove Velso virus?